Time to expand the Space Station! Tired of the same old Core Modules? Let’s upgrade, then! We’ve designed a limited edition promo pack with 4 new Core Modules to add more variety to the game. With the Space Station Promo Pack, all 6 colors are represented as Core Modules, introducing new effects and powerful combinations. Each new Core Module enhances the theme of its color, thus encouraging strategic expertise. Be careful, though; you’ll never win with only one color. 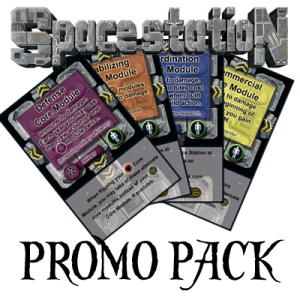 The Space Station Promo Pack consists of 2 double-sided cards, each side with a unique new Core Module, either Military (purple), Support (brown), Scientific (blue), or Luxury (yellow). It will be released in Essen, where it will be included in the FryxGames Game Pack (Space Station + Promo, Wilderness + Promo, 2x Brawling Barons), or as separate item. This limited edition will only be available through us. The second edition of Space Station is now on its way. It will be officially released at Essen Spiel 2012 in Germany, with some new graphics, a new game box and some modified cards. 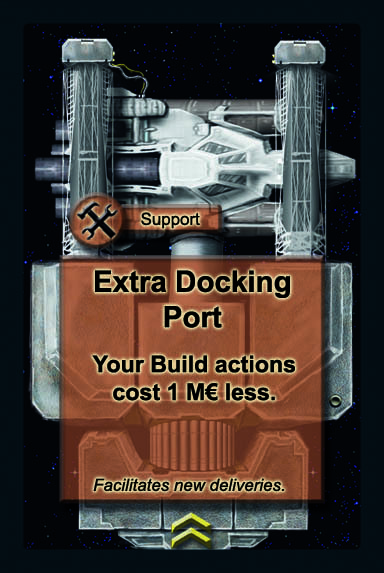 To give you something to long for, here is the new Extra Docking Port module. Along with 7 other modules it got a facelift for this new edition. Enjoy!